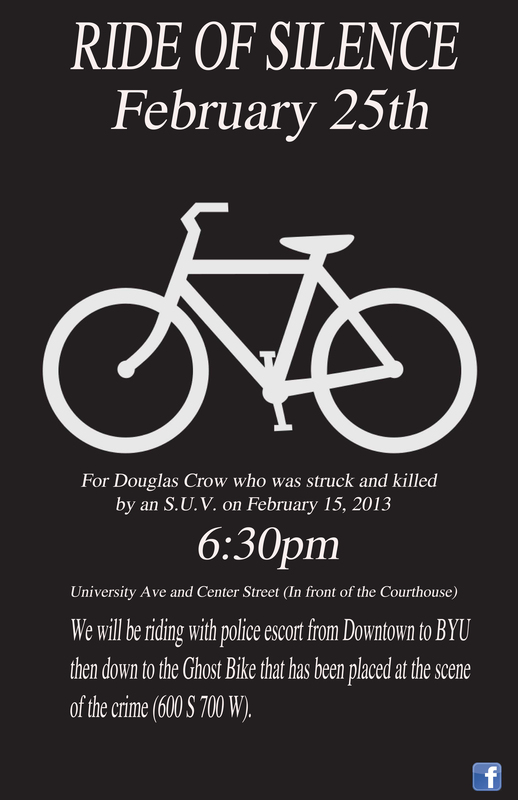 The following guest post was submitted by Provo bicycling mom Rachel Whipple, who participated in last night’s Ride of Silence in honor of Douglas Crow. She has also given up cars for lent. It felt reverent. 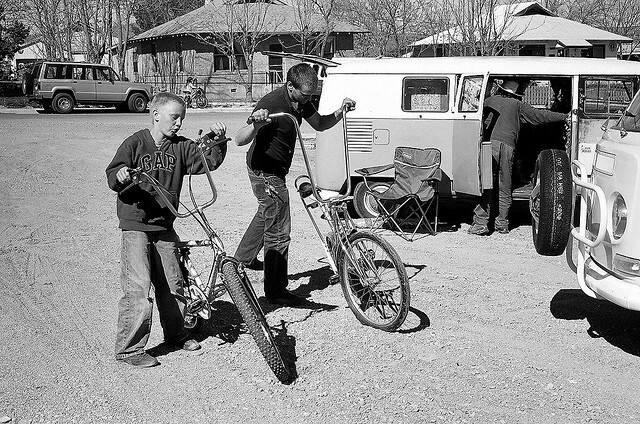 There were more than a hundred bikes of all kinds: little kids in trailers, a dog in the basket of a giant tricycle, kids pumping their single speeds, college-aged kids, couples on bikes built for two, and grandparents. All kinds of riders came out, from the serious sport cyclists, bicycle commuters, and people like me pedaling along on hand-me-down bikes. Some of the more confident cyclists were designated to block the intersections, guarding the way for the rest of us to safely pass. Police bikes escorted us and a police car was our rearguard. It was quiet. The ride had all the dignity of an old fashioned processional. It was as solemn as a line of cars leading to the gravesite. But we were not hidden, sheltered in the privacy cars; we were out, exposed in both senses: we feel everything, the wind and the cold, and we are seen, visible to all we pass. It was community. We were mourning with the family in their mourning. 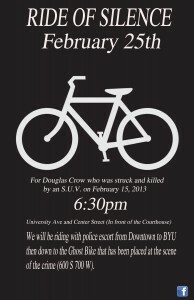 We were thinking about our own mortality as we rode the same roads Mr. Douglas Crow rode. We were together, respectful of the family, honoring the fallen man, and pleading silently to everyone who saw us as a group to see us when we ride alone. 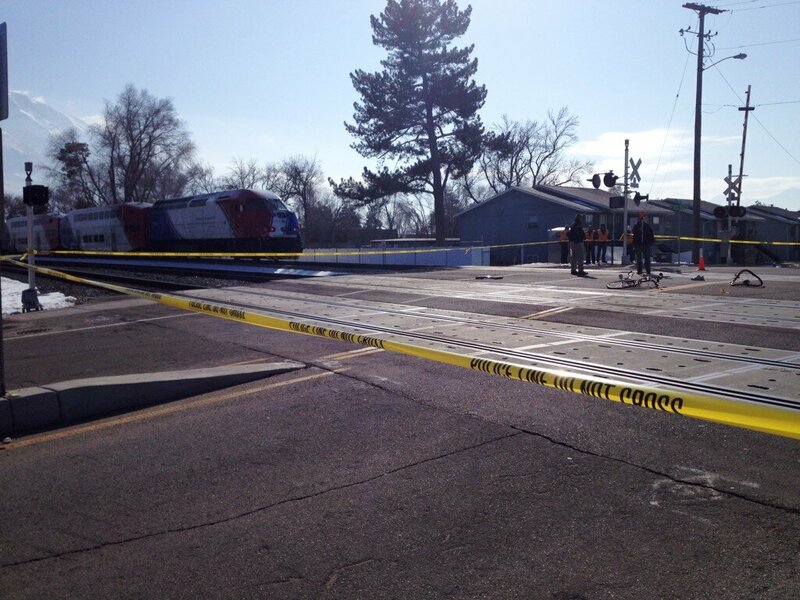 The sounds we passed felt significant in our silence: the striking of the hours of the courthouse clock, the clanging of the arms that heralded the coming of the train. And then as we turned back to home, the moon rose over the mountains, full bright with mellow light. I rode, quiet in my thoughts. And I felt overwhelmed with love and awe for all who rode with me. And I hope that all who saw us marveled. Not everyone has the cash the to buy a complete hand built bicycle with all the dreamy components to make the cool kids drool. Sure you could donate plasma for months and months till you have the coin to scoop up a Rivendell Hunqapillar, but that might be a little to intense for your speed. So are you forever stuck with your classless steed doomed to ride your miles in mediocrity? 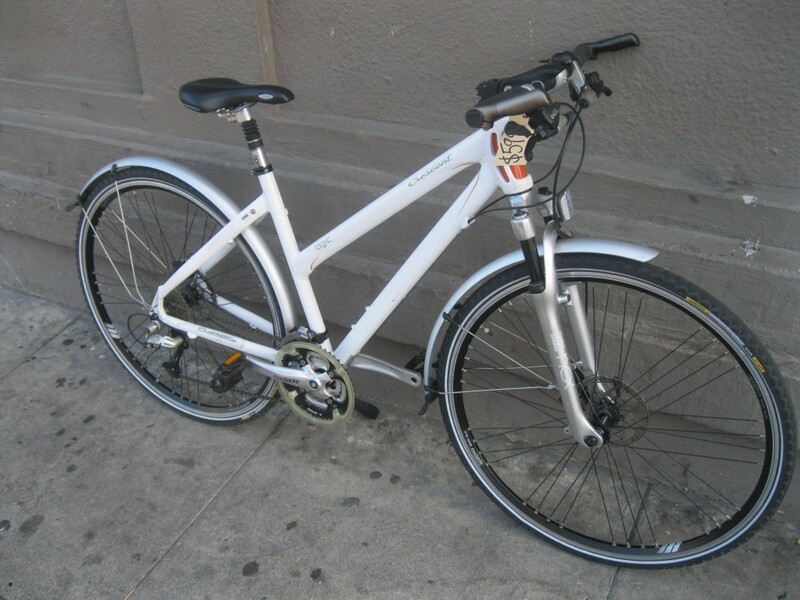 Well here are some quick and easy things you can do for you bike to make it stand out from the pack. Some of the hottest bikes out there are quite often the simplest. 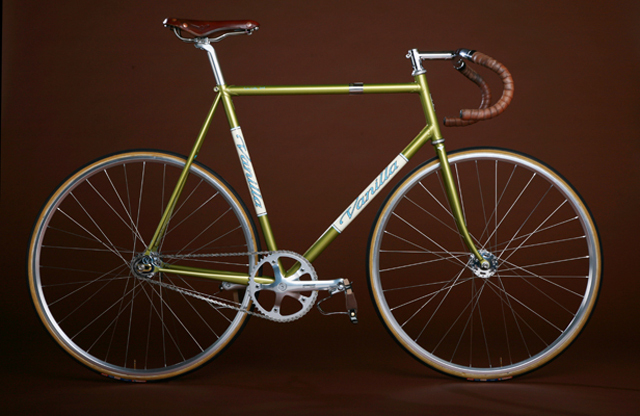 One of the appeals of a fixed gear bicycle is its simplicity. So it would make sense that to give your bike a little class is to keep it clean. Don’t leave your cable lock wrapped around the top tube, carry it in a bag. Remove old and faded reflectors and replace them with much safer and removable be seen lights. Are you sponsored by Huffy? Probably not, so there is no sense in giving them free advertisement, stripping off decals and stickers is also a quick way to clean up a bike. Bottle cages are a great way to stay hydrated on a long 50 mile rides, but they clutter up the bike for the under two mile trips you make daily. Slimming down isn’t the only way to breath new life into your bike. Adding fenders is not only a great functional addition to any bicycle, but a set of full fenders really gives your bike a classic look that will stand the test of time. There a quite a few options to appropriately compliment your bike with ranging colors and materials and can be found used at your local Bicycle Collective. Although a saddle is a steeper investment than most, its one that is considered the most important if you put any miles on your bike. Not only does a quality saddle get the looks, but your rear will thank you in the long run. 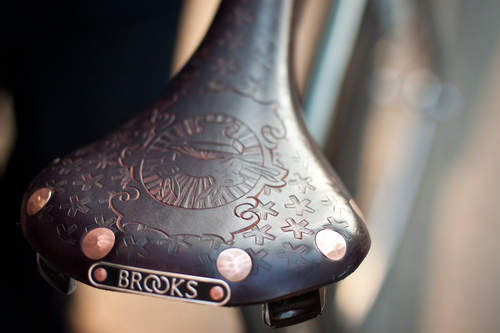 Nothing says class and heritage than a B17 Brooks Saddle, they are pricey but well worth the investment if you take care of it. There are options as well for the more animal conscience cyclist, there are plenty of vegan saddles that have just as much style and comfort. Your cockpit is a place on your bike that can get overwhelmed with unnecessary attachments and mounts that can detract from the overall look of your bike. Back to the “simpler is better” mentality, less is more. Replace your complex index shifters with the ever reliable friction shifter. Grips get gummy and gross over time, put on a bright set of Ourys to make your mitts happy. The only peripheral attachment that should be put on a handle bar that isn’t brake handles or shifters is a bell, but keep that bell simple. Though not for the faint of heart, a sure fire way to make the ladies swoon and fellas holler, the ape hangers. Remember the Rule of Apes. “The taller your bar, the cooler you are”. 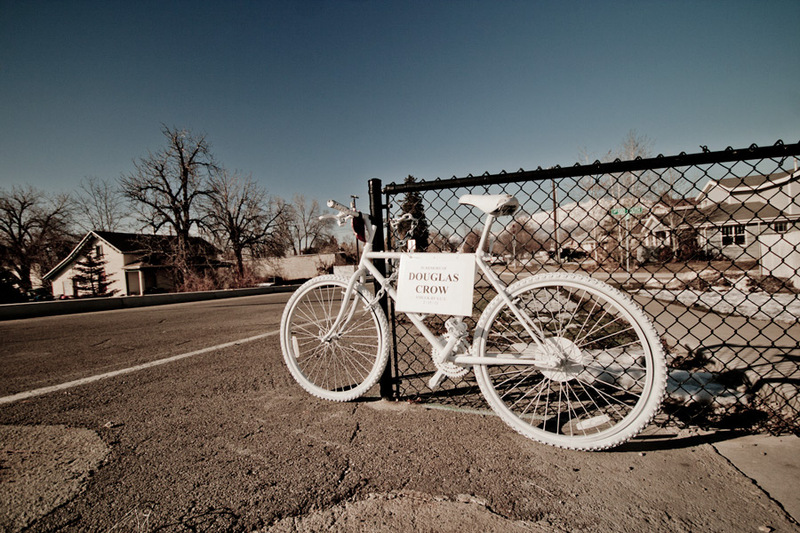 The Deseret News recently published an article reviewing our progress towards completing the Provo Master Bike Plan – plans and funding for an extensive set of interconnected bicycle lanes throughout the city. 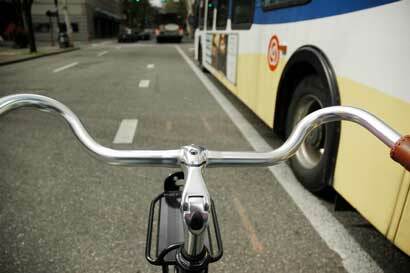 “The city is likely to approve an extensive new series of bike lanes by as early as April. 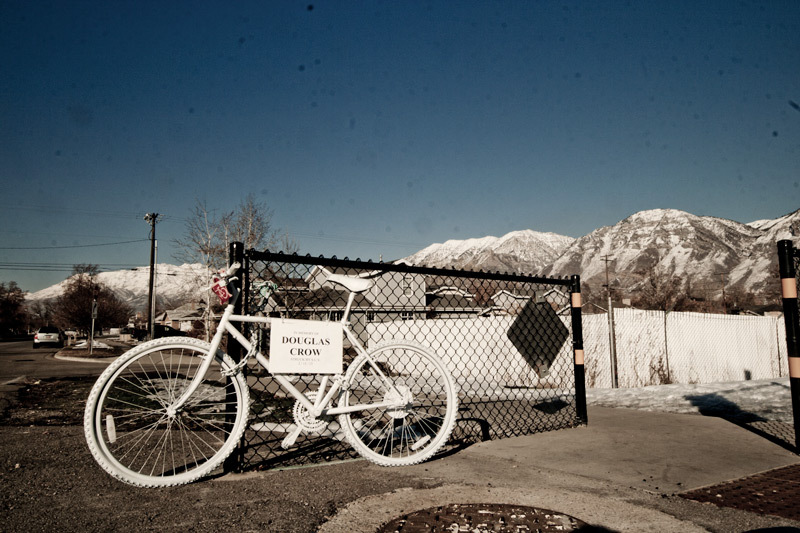 Transportation advocacy groups such as Bike Provo have asked for additional bike lanes for the past three years, saying the city needs to update what they consider to be outdated safety conditions for bicyclists. 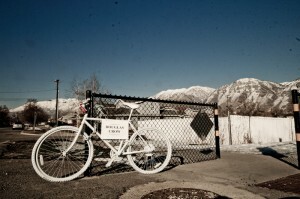 ‘There’s so much work left to be done, but I think the plan is a good groundwork,’ said Andrew Ungerman, a volunteer with Bike Provo. 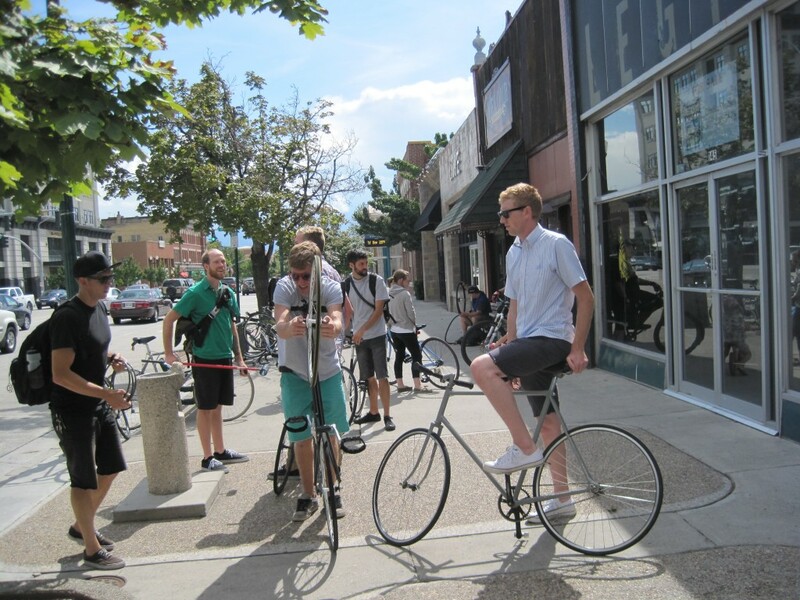 Take a look at the full article here and keep watching BikeProvo for updates as we get closer to the finalization of the plan and the vote by the Provo City Council. I found this story of love to be touching. Even through courting, parenting, and old age, love and bikes have remained. Don’t let the cold air stop you from riding!